Casual observers driving from Charleston on US 119 headed towards Clendenin may spot telltale clues of the Kanawha and West Virginia Railroad but they are few in number. 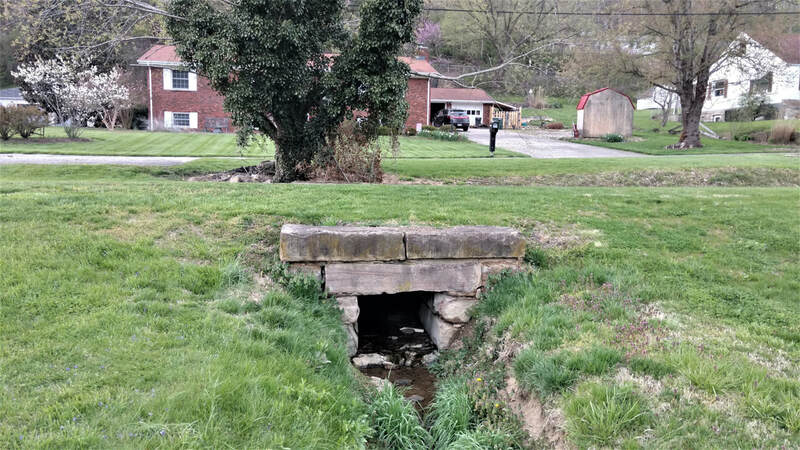 As they pass by the residential areas of Elk Hills, Mink Shoals and the tight confines adjacent to Elk River, there is barely any evidence that a railroad ran through here. Only upon arriving at Big Chimney and into Elkview does this piece of the past become more obvious as remains of the right of way and bridge piers left standing at creek crossings offer a residual look of what was. 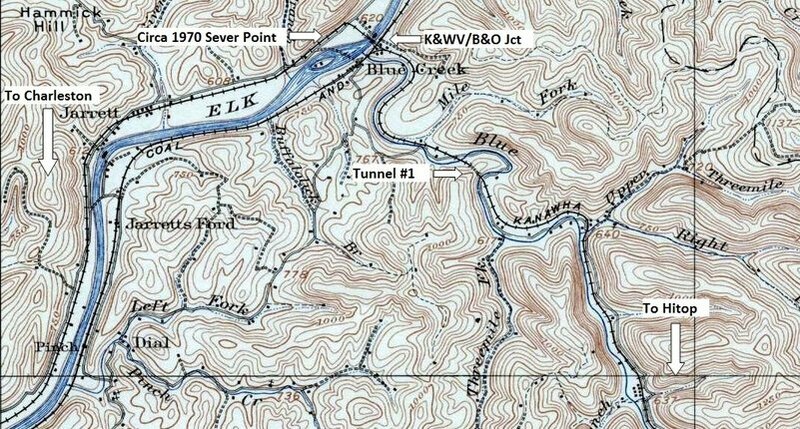 In earnest, it is at Blue Creek where the tracing of history readily appears to the eye as remnants of the K&WV are visible as the line followed the Blue Creek basin through small communities until reaching its terminus at Blakely and Hitop. This particular railroad is an anomaly when studying the general rule of the life span of branch lines. Typically, it is the extremities of a route that are abandoned first and the line regresses or shrinks towards its point of origin. The Kanawha and West Virginia did the exact opposite because of external developments and by virtue of an alternate route available. During its construction during the early 1900s, its objective was to tap the coal and timber of the Blue Creek basin. Not known at the time was that the line had actually been constructed over a gold mine---black gold, that is. Within a decade of its inception, the great Blue Creek oil field was discovered and it was literally drilled alongside the right of way. This boom lasted for a few years and the railroad slowly returned to its status as a coal hauler with minute amounts of manifest sprinkled within. The K&WV remained a passenger hauler mainly due to the remote area it served with limited access and ran dedicated "school" trains lasting into the early 1960s. A mere 34 miles in length, the section from Blue Creek to Blakely generated the overwhelming amount of revenue and is the most familiar. Charleston to Blue Creek contributed to the passenger base but little on line freight business lay within this region outside of the capital city itself. 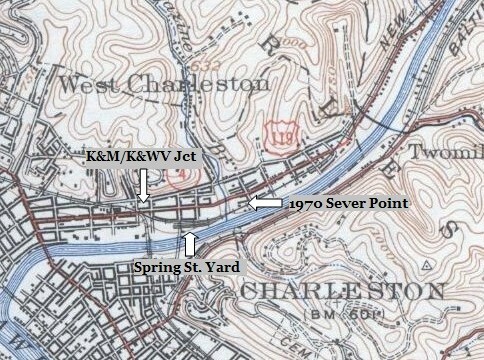 The K&WV utilized a small yard at Spring Street in Charleston and a few trackside shippers in the vicinity that continued into the Penn Central era. To be sure recorded documentation and historical images of this line are rare as the route was largely overlooked by rail enthusiasts and historians. Now dormant for a quarter century, what remains of the K&WV is in wretched condition. Track is still in place from Blue Creek to Hitop although there are sections that have been removed. Charleston to Blue Creek is a distant memory as this stretch of railroad was abandoned and removed circa 1970. Plans of resurrection flourished in 2010 with the announcement of a proposed railroad christened as the Charleston, Blue Creek, and Sanderson Railroad and the reopening of mines along the Blue Creek drainage. This line would use the former B&O from Charleston to Blue Creek and henceforth to Sanderson via the former Kanawha and West Virginia (NYC). The plans for rebuilding this line and resumption of mining along Blue Creek did not materialize and the furor faded into the background. Whether the CBC&S is ever built remains to be seen. In one respect, this page can be considered a companion piece to﻿ B&O Charleston Division Part I--Charleston to Blue Creek﻿. The histories are similar and actually intertwine, particularly from the Penn Central era until both ceased rail service. References to B&O will be frequent and both pieces on this web page can be cross referenced. While some replication may occur, I will attempt to minimize it and especially in the area of image use. Archival photos on this page will also contain glimpses of B&O predecessor Coal and Coke Railway. The beginnings of the Kanawha and West Virginia Railroad were complex in corporate structure as it involved multiple parties and the transferring of ownership. More indicative of modern day mergers and holdings, the melting pot that became the K&WV is a story that would impress the most astute of attorneys. 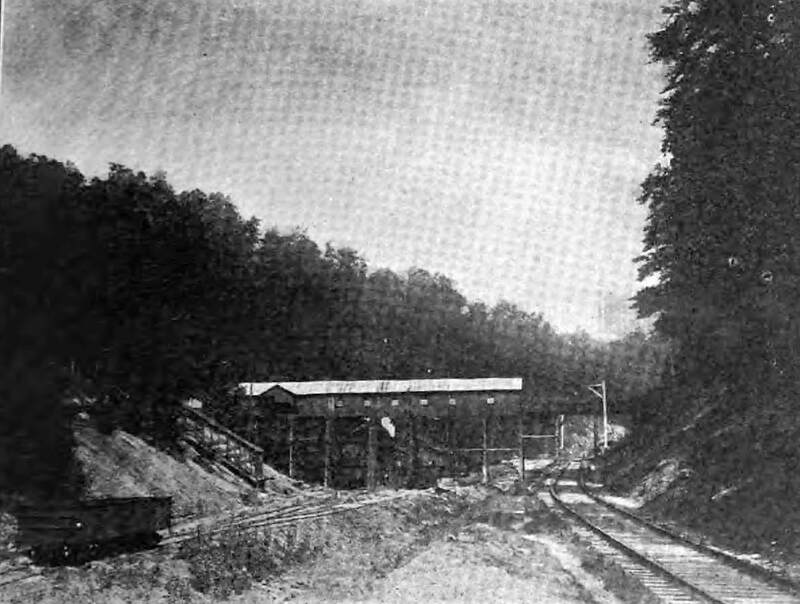 Initially incorporated as the Imboden and Odell Railroad in 1903 and lasting until 1905, the tiered structured ownership through holdings went as follows: The Kanawha and West Virginia Railroad, controlled by the Kanawha and Michigan Railroad (K&M) which in turn, controlled by Toledo and Ohio Central Railway, of which itself was a subsidiary of the New York Central Railroad. 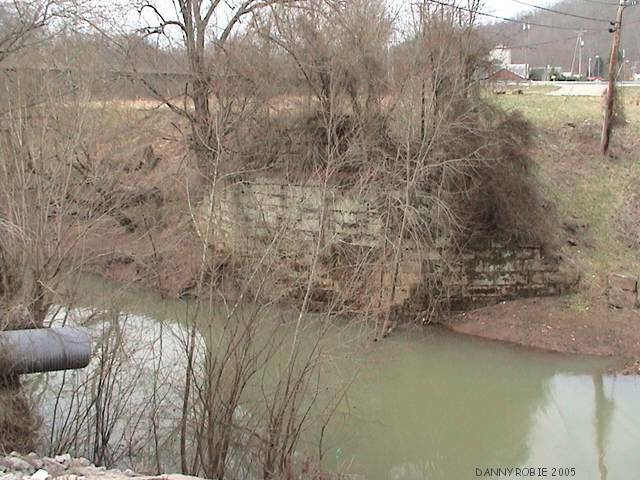 Of note is a smaller disconnected section of the Kanawha and West Virginia Railroad that was constructed to the east in Nicholas County. 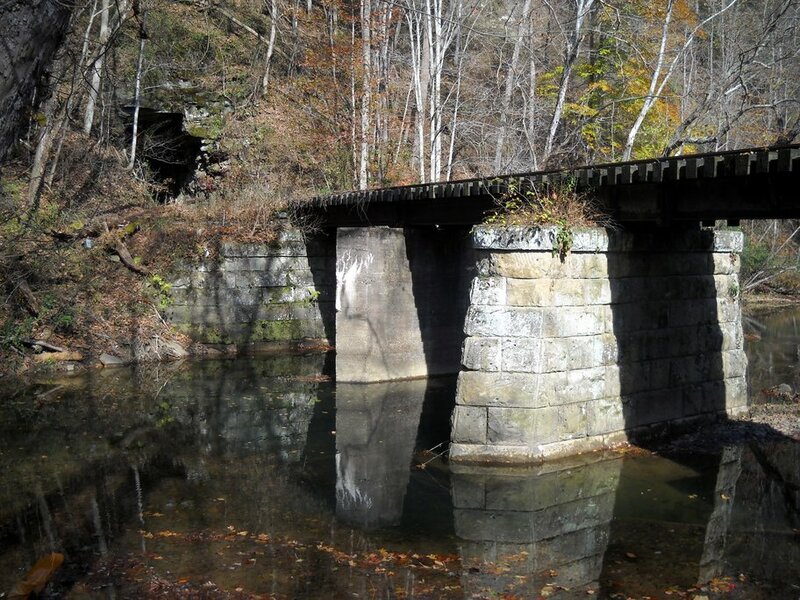 This piece of railroad was approximately four miles in length --originally planned as an extension over the Blue Creek divide---and connected the towns of Belva and Swiss of which access was over the Kanawha and Michigan (K&M) via Gauley Bridge. By 1938, the K&WV, in addition to the K&M, was outright consolidated into and operated by the New York Central. Construction of the 34 mile long railroad from Charleston to Blakeley was also completed in phases with the Blue Creek to Quick section built and completed 1903-1905. Charleston to Blue Creek and Quick to Blakeley were constructed in the years spanning 1905-1906. With the completion of the Elk River bridge, the railroad was operational in its entirety by 1907. Two wyes were constructed on the route to facilitate the turning of steam locomotives--one in Charleston adjacent to Magazine Branch and the other to the west of Blakeley. Passing sidings were constructed at Quick, Morris (west of Sanderson), Middle Fork (east of Sanderson), and Blakeley. These sidings served a dual purpose to allow a passenger train to pass a coal train as well as for locomotives to runaround a cut of hoppers to and from the mines. Curiously, there is no apparent evidence of any such sidings existing between Charleston and Blue Creek. This is from both a cartography record and visual inspection of the right of way. 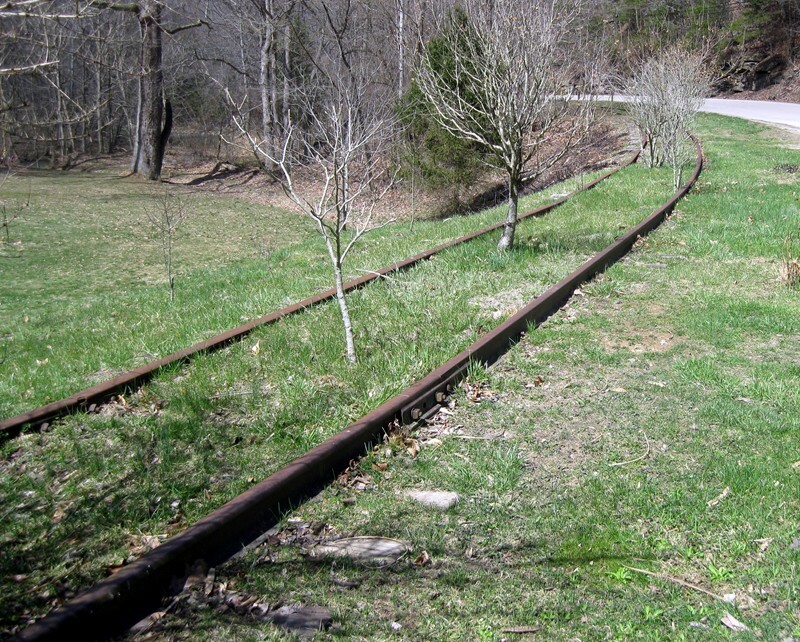 When the K&WV first laid rails in Charleston, there was no yard; within several years, one had been constructed at Spring Street to stage cars to and from the Blue Creek region. Natural obstacles were overcome with bridges--many as matter of fact. No less than thirty bridges spanned Blue Creek and its tributaries. The Elk River bridge and creek crossings on the line between Charleston and Elkview, though fewer in number, increased the total number. Construction of these bridges was a varied sort consisting of truss, plate, trestles and combination trestle/bridge spans. Tunnels at Three Mile and east of Quick, respectively, were drilled during construction of the line. 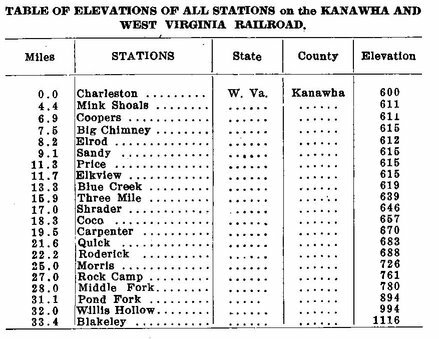 Although relatively short in length, the K&WV climbed substantially in elevation from Charleston to Blakeley. From Charleston at 600 feet above sea level to Roderick at 688 feet was modest---the emphatic climb began there until reaching Blakeley at 1116 feet. From the World War II era, the New York Central, now the outright operator of the route, operated coal and passenger trains between Charleston and the Blue Creek drainage extending into the 1960s. Coal traffic was subject to ebbs and flows, demand of the present economic conditions, and of course, stability of unionized labor relations. As was the general pattern of passenger rail, ridership declined in the post- World War II era although the K&WV, due to the demographic and topographic nature of its domain, continued to operate longer than most secondary and branch lines. Once steam power disappeared and train sizes decreased during the early 1950s, the New York Central began running a RDC (rail diesel car) to serve the remaining passenger base. This was essentially a bus on rails for it was a single powered car with crew and passenger seating. Of special note with this operation was the "school" runs that transported students to and from the communities of Blue Creek to Elkview. 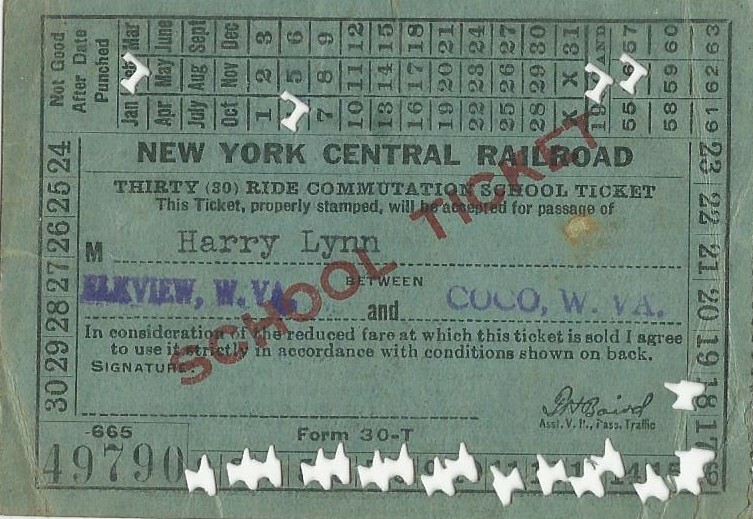 A school ticket to ride the New York Central between Elkview and Coco during 1956. Student passengers accounted for a large percentage of ridership. My thanks to Harry Lynn for contributing a scan of his ticket for this page. 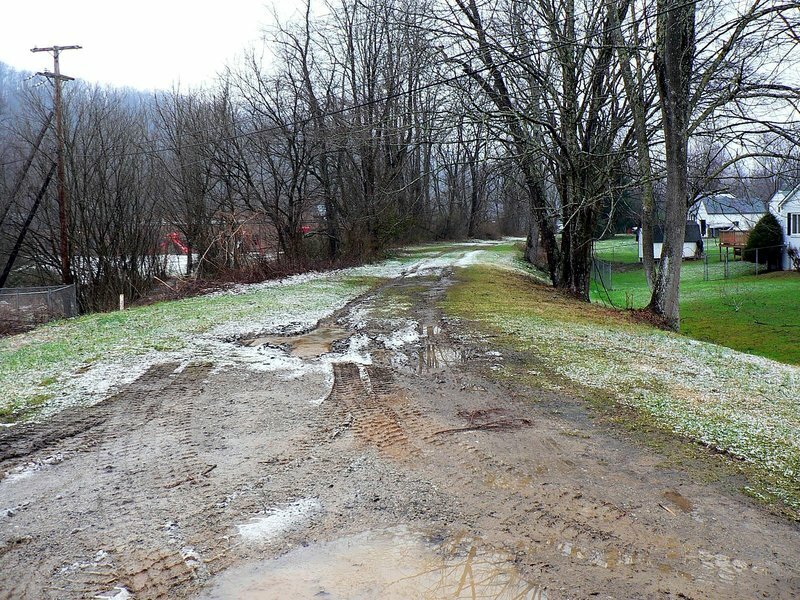 The most significant change to occur along the former Kanawha and West Virginia was during the late 1960s when the section of line between Charleston and Blue Creek was filed with the Interstate Commerce Commission (ICC) for abandonment. Several factors were at play during this time period that resulted in the closure and subsequent removal of track. First, New York Central had suffered numerous derailments on the line that often affected highway traffic on US 119. Maintenance was minimal and lighter weight rail had not been replaced as equipment became larger and heavier. Second, there was no online revenue generated from outside the Charleston city limits to outskirts of Blue Creek rendering the decision to remove the line easier. Finally, trackage rights were negotiated and obtained on the B&O from Charleston to Blue Creek thereby providing an alternative route. 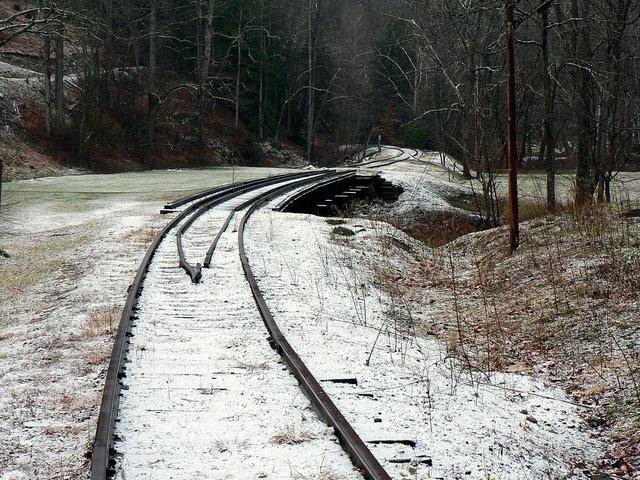 A connecting track at Blue Creek enabled trains to diverge from the B&O onto the remaining K&WV track along the Blue Creek watershed. In addition, two customers on the opposite bank of the Elk River could still be served via this route since the bridge crossing the river was still intact. By 1968 and now into the Penn Central era, coal traffic used the B&O from its junction with the PC at Capitol Street to Blue Creek. Although the K&WV route was officially abandoned in 1967, I have memories of ties and rail stacked at various locations circa 1970, a date used on this page as a reference of changed operations. Another factor to consider regarding the abandonment of the K&WV from Charleston to Blue Creek was the planned development of the Interstate Highway system through the West Side of the capital city. A substantial section of residential and commercial neighborhood bordering Pennsylvania Avenue in Charleston was razed for the interstate construction which included the area extending to Mink Shoals. The K&WV right of way also paralleled Pennsylvania Avenue (US 119 outside of Charleston limits) and it was obliterated by highway development. Had the line not been abandoned in 1967, it certainly would have faced the same fate within a few years. The yard at Spring Street was no longer used for its intended purpose once the K&WV line was cut. Trackage remained in place for several years although the yard was void of cars excepting for a gravel operator located on the side adjacent to Elk River. Occasional hopper cars would spot here in addition to warehouses east of the yard near the mainline sever point receiving boxcars. There was also a junkyard located near the former K&WV junction with the Penn Central mainline. By the onset of the 1980s, all of these shippers were gone. My personal K&WV recollections are vague of the 1960s but firmly entrenched from the mid 1970s. Penn Central GP7s and GP9s would work the warehouses switching boxcars and the junkyard moving gondolas. Fond memories in this neighborhood spent with my father still resonate today. He would tell about busier times at the Spring Street yard and of trains running beside US 119 to Big Chimney and Elkview. There were the trips to the Big Star supermarket on Bigley Avenue and the stops at the Ashland gas station on Spring Street for fuel and a cold drink. Not directly linked to K&WV rails but in proximity were the outings at Big Toes junkyard---which had everything imaginable--- along the river and the Fountain Hobby Center. And then there is the unforgettable mouth -watering aroma of the Purity Maid bakery beside the Penn Central main at Bigley Avenue. None of these businesses remain today but for the Fountain Hobby Center. 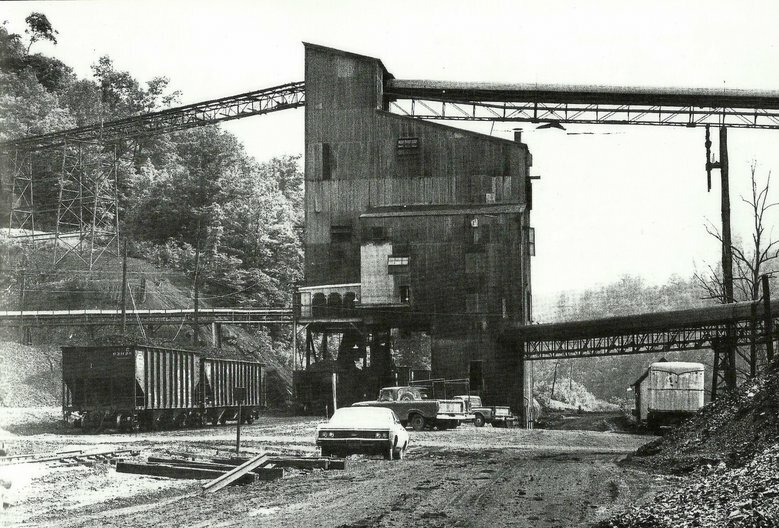 During the 1980s, Conrail ---now the successor to Penn Central---continued to run coal trains to the Union Carbide mines along Blue Creek and switch the Clendenin Lumber Company and Halliburton. These runs averaged about two per week and continued until near the end of the decade. The mines either closed or ceased using the railroad altogether. Clendenin Lumber had closed its operation at Blue Creek and only Halliburton remained. It subsequently shifted its transport exclusively to truck effectively ending all revenue sources for the railroad. In Charleston, the few shippers that were located at the vicinity of the Spring Street yard either vanished or switched to trucks. 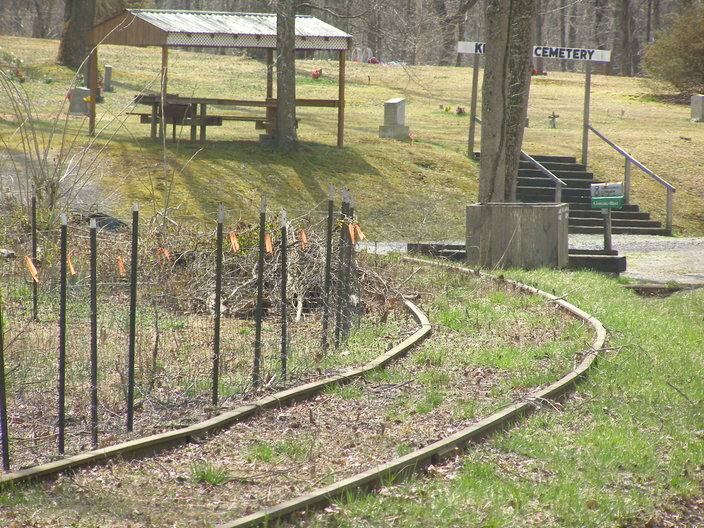 The track here lay dormant although most of the rails were removed from the yard itself. The only evidence that multiple tracks existed were the rails embedded in the Spring Street asphalt. By the 1990s, all remaining track was removed and a new Foodland supermarket built upon the real estate once occupied by the K&WV yard. Few traces of the railroad can be found here today. 1935 topographic map focusing on the Elk River area of Charleston. Immediately north of the river is the Kanawha and West Virginia (K&WV) connection to the Kanawha and Michigan (K&M) both of which would become New York Central (NYC). The Spring Street yard is to the east and the railroad parallels Pennsylvania Avenue as it moves east. 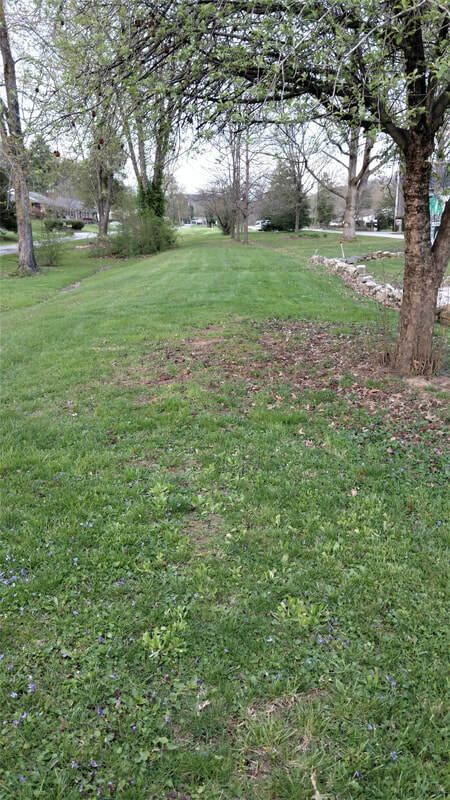 Also indicated is the circa 1970 sever point--intersection of Mary Street and Pennsylvania Avenue--- where the track was cut and removed from this location to Blue Creek. The K&WV was a railroad of tight confines. Its right of way fit snugly between roads and river, streets and neighborhoods, highway and hillsides, creeks and bluffs. Add to that within the city of Charleston, cramped locations also included street borders and running between buildings. Settings such as these highlight increased awareness at immediate surroundings from an operations perspective; for the astute rail enthusiast or modeler, an added level of interest and character. The Broad Street grade crossing as it was in 1970. A Penn Central coal train is diverging from the B&O in Charleston with loads from the Union Carbide mines on Blue Creek. The K&WV between Charleston and Blue Creek now abandoned, the B&O now fills the role between the two points. In the background is the old K&M/NYC freight terminal---today it is the Capitol Street Market and the Interstate ramp would now dominate this view. From the zebra based grade crossing flashers to the PC GP9, the scene harkens of boyhood memories for this observer. Image Jerry Taylor/courtesy Indiana University Press. All rights reserved. What little manifest the K&WV and in the later years, the New York Central, moved was effectively confined to the city limit of Charleston. Distribution warehouses were constructed in the vicinity of Pennsylvania Avenue at a quadrangle to Bigley Avenue and were served by boxcars. Earlier years witnessed a freight house that occupied space between Pennsylvania Avenue and the Spring Street yard. A junk dealer was served by a spur from the K&WV main near its junction with the K&M/NYC main. In the old Spring Street yard along the bank of the Elk, a small concrete preparation loader was active for a few years after the K&WV main to Blue Creek was cut. The majority of these shippers remained into the Penn Central era but were gone by the onset of Conrail. All remaining track in this area was completely removed circa mid 1980s and by the 1990s, the Foodland supermarket occupied the former yard area. Other developments and street expansion work virtually obliterated the former K&WV right of way in the city limits. Google Earth image of the area immediately east of Charleston limits. On the north bank is the path of the long gone K&WV right of way through Mink Shoals into Crede. 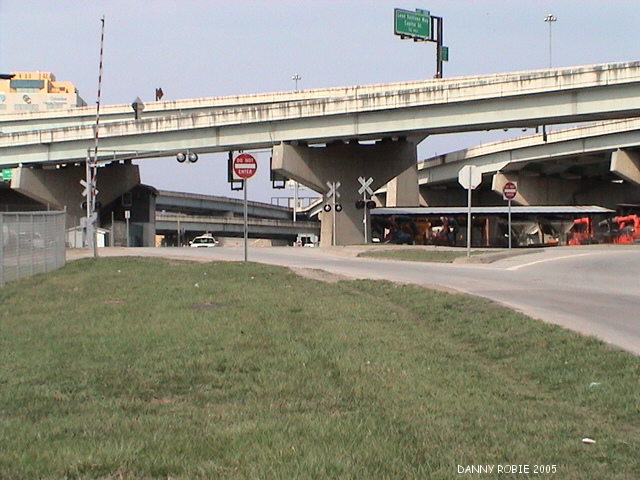 Interstate construction and development has obliterated most traces of its existence. 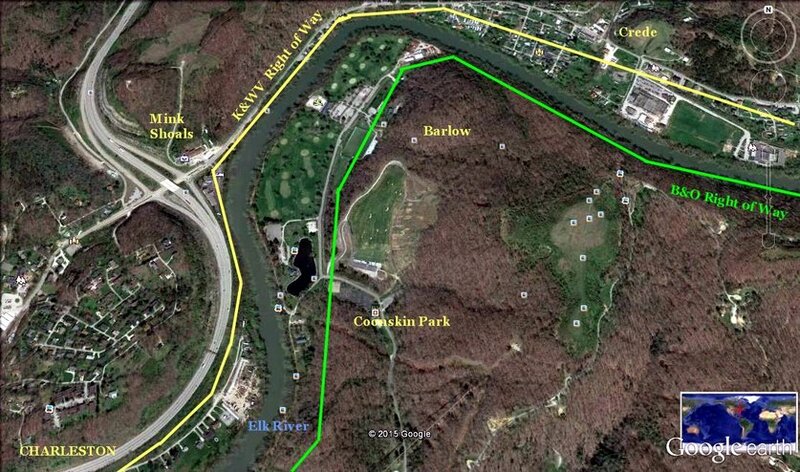 On the south bank the B&O through Barlow and Coonskin Park is indicated as a correlation of two once moderately busy railroads that flanked the Elk River. 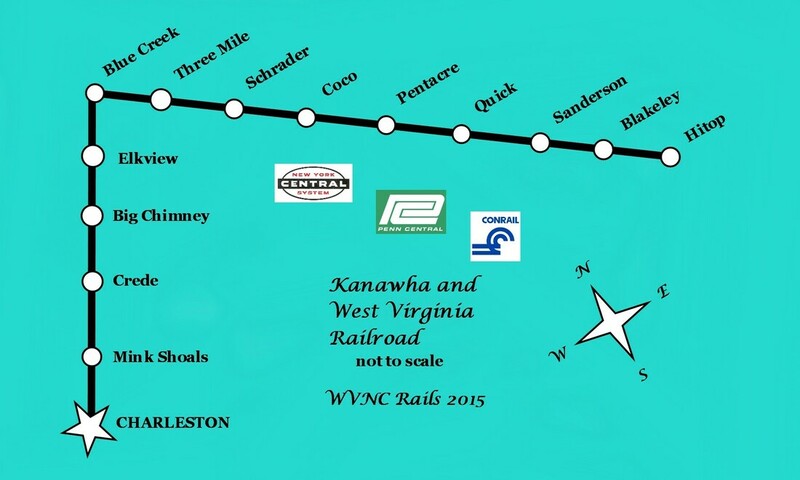 Perhaps the greatest oddity about the Kanawha and West Virginia Railroad is that the most accessible region it traversed is also the least documented. 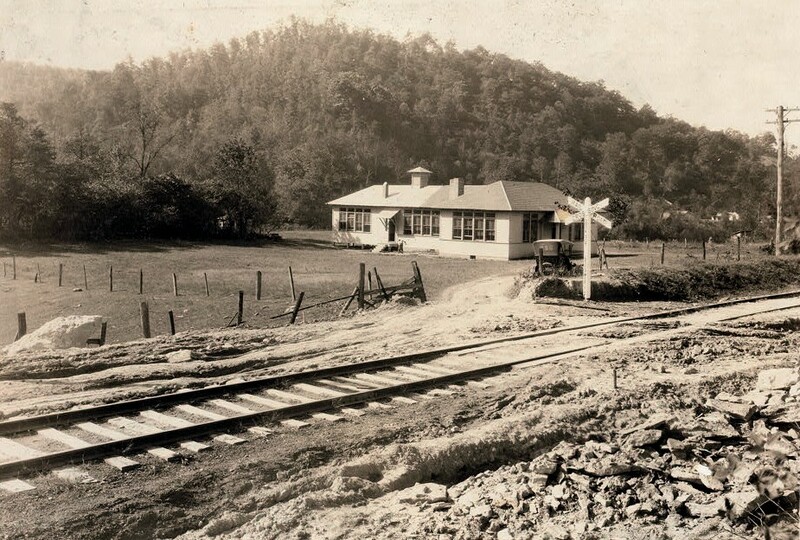 The railroad outside of Charleston to Blue Creek paralleled US Route 119 as it passed through Big Chimney, Elkview, and smaller communities along this stretch. Yet photographs of the railroad through this sector are scarce almost to a point of non-existence. Among the myriad of West Virginia communities with uniquely colorful names is Big Chimney, located along the Elk River approximately nine miles east of Charleston. Situated at the mouth of Coopers Creek, the discovery of oil here predated the great Blue Creek field a few years later. 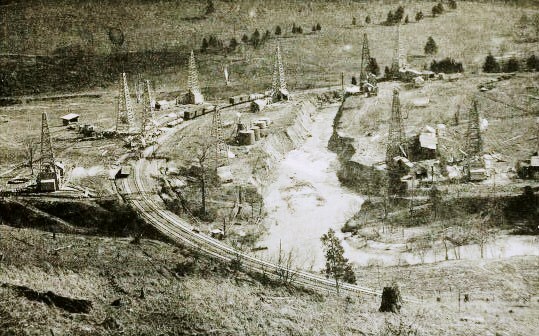 Oil derricks were located along the Coopers Creek drainage and the area was the site of a salt furnace with a large chimney from which the community took its name. The salt production was short lived; ironically, it was the oil that contaminated the underground salt and rendered it useless. Big Chimney was a whistle stop during the K&WV era continuing into the twilight years of passenger service on the New York Central. Its depot, long since vanished, was located east of the mouth of Coopers Creek. There is no evidence of any shipper located here aside from the salt works during the early 1900s and the transport of oil drilled in the area. Its depot, long since vanished, was located just east of the mouth of Coopers Creek. A 1935 MyTopo map of the region from Crede to east of Big Chimney. 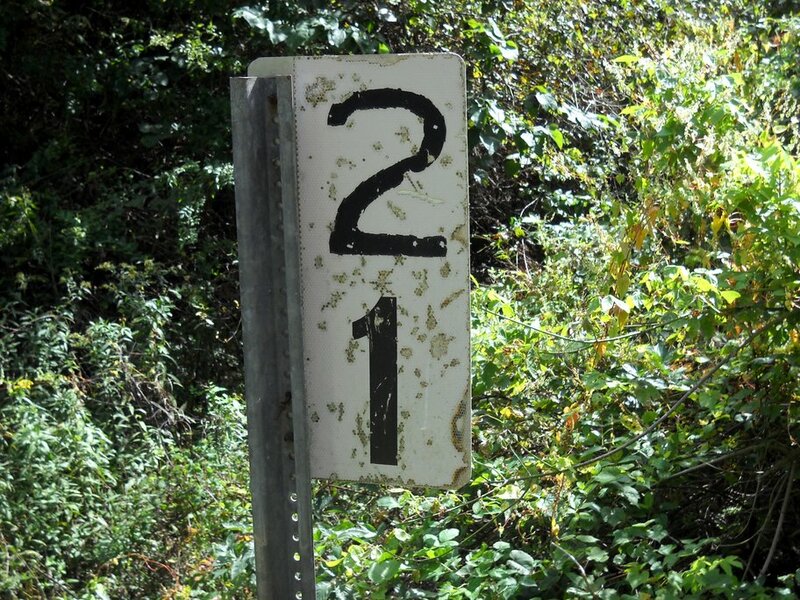 The K&WV---NYC controlled by this date---parallels the highway and Elk River as it passes through the communities. A view looking southwest along the K&WV at Big Chimney. This circa 1910 image offers a glimpse of the Big Chimney Grade School and the bottom land along the river as it looked a century ago. Architecture once reflected pride in design such as the school house and railroad crossbucks---contrast that to the rather utilitarian blueprints churned out today. To the rear of the school can be seen the community of Bream across the Elk River. Image Library of Congress. 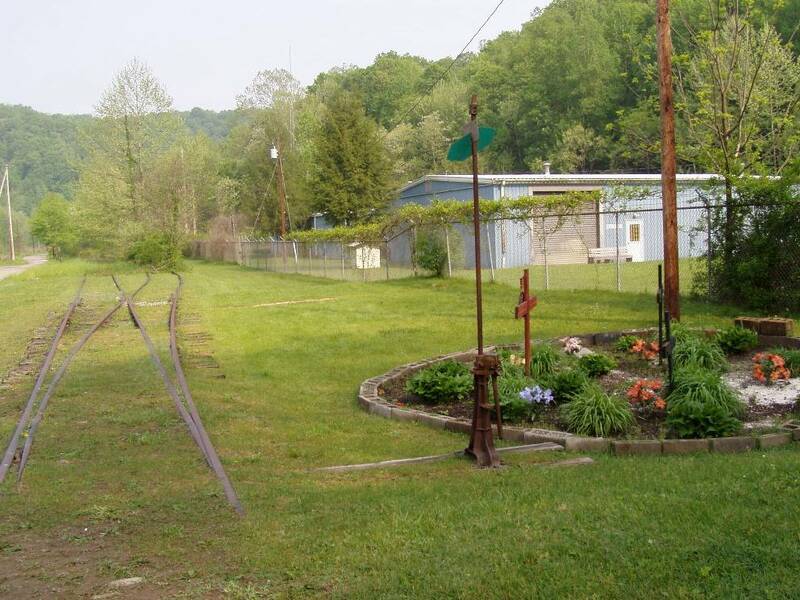 The railroad paralleled US 119 along its trek from Big Chimney to Elkview and traces of the right of way are still discernable here. It was this stretch of track that became notorious for derailments because when one occurred, the result was coal dumped in the highway obstructing vehicular traffic. As the track was literally adjacent to the road in this area, this was a major concern that ultimately resulted in pressure from state agencies for the New York Central to solve the problem. The NYC elected to solve the issue permanently--it negotiated trackage rights over the B&O on the opposite side of the Elk rendering the K&WV route between Charleston and Blue Creek dispensable. 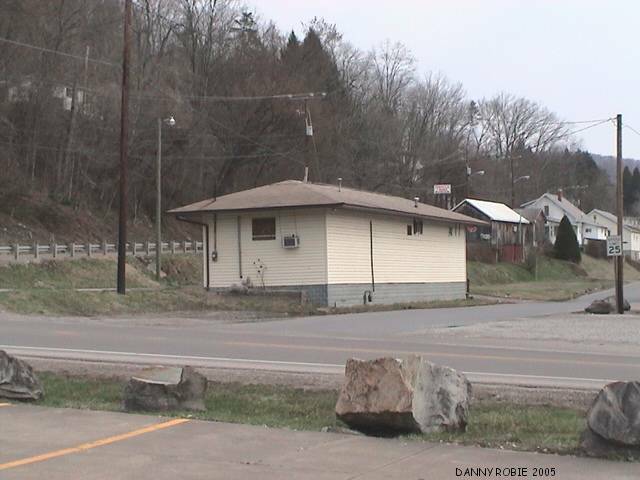 Elkview once was referred by the name of Jarrett and the place name still existed during the early years of the K&WV. Although there is no evidence of any large shippers having been located here, the railroad served the community by virtue of a depot and any associated business during the great oil boom. During the passenger era, it was among the prominent stops on the route and is fondly remembered during the twilight years with the "school" train. 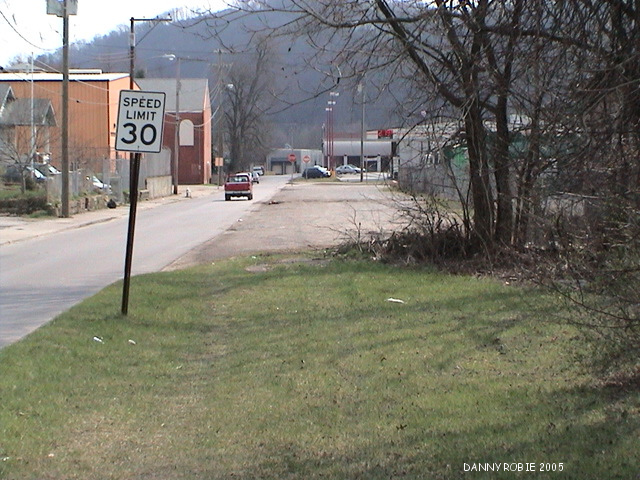 Elkview High School was a targeted destination for these runs to and from the Blue Creek watershed. 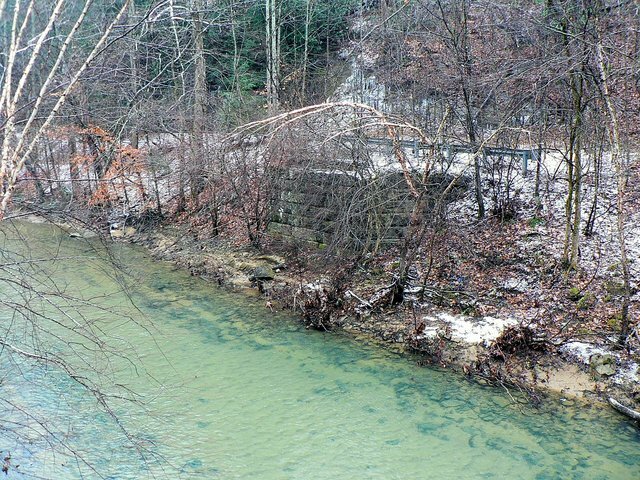 Now gone for nearly fifty years, traces of the railroad right of way are still visible and most notably, the area between Elkview and Blue Creek. The depot remains as the last landmark on the railroad between Charleston and Blue Creek and has housed various businesses throughout the years. This 1907 MyTopo map diagrams the K&WV on the eve of its heyday during the oil boom. 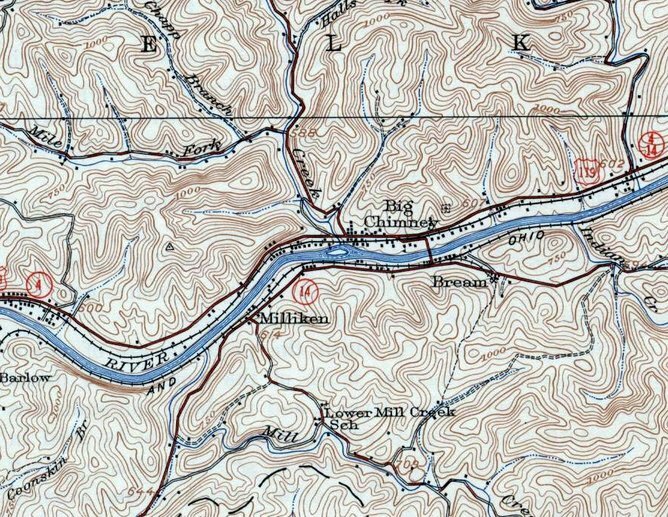 Centering on the Blue Creek region, the railroad is depicted from west of Jarrett (Elkview) to an area beyond Blue Creek along the namesake stream. This also reveals the relationship of the Coal and Coke Railway--later B&O-- that experienced both conflict in the early years to cooperation during the final years. In the grand scope of railroad history, the Kanawha and West Virginia is little known outside the realm of West Virginia or to students of New York Central ancestry. Its small size accounted for the scale of the obscurity and once absorbed into the New York Central, it was a tiny piece in a giant railroad system. But to those who lived near it, rode or worked its rails, there is no doubt as to the heart and soul of the line. Mention K&WV and the immediate connotation is the Blue Creek region. It is interesting to note that construction of the Kanawha and West Virginia began at Blue Creek in 1903 and was completed to Quick by 1905. 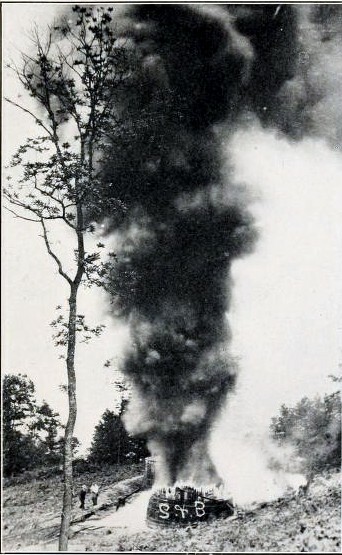 This involved a dependence on the Coal and Coke Railway during this construction phase for material and is indicative of the connecting track between the two from the earliest years. The initial economic reason for building the railroad along the Blue Creek drainage was to tap timber stands and coal reserves. Timber was short lived as a source of revenue for the K&WV as it had effectively faded by the 1920s. Coal proved to last considerably longer with the final trains laden with black diamonds passing through Blue Creek circa 1990. Exceptional image from 1913 depicting the Blue Creek oil boom in full glory. A plethora of oil derricks populate the landscape and a huge storage tank dominates the foreground. The K&WV Elk River bridge and right of way are visible at left as is the Coal and Coke Railway crossing of Blue Creek. Note the structures related to both the oil boom and the railroads. Image West Virginia Geological Surveys. 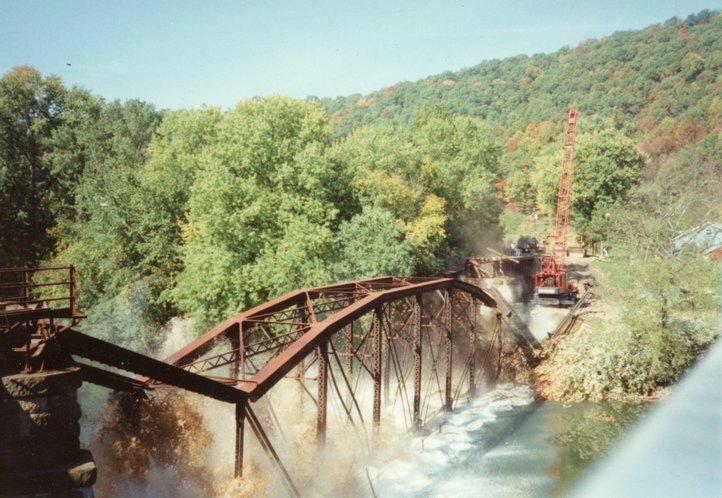 During the mid-1990s, a new road bridge was built across the Elk River and the old K&WV bridge was modified to accommodate vehicle traffic during its construction. This image was taken after it fulfilled that purpose and is awaiting demolition. Image courtesy Mike Thomas. For the first time since 1907, a railroad bridge no longer spans the Elk River at Blue Creek. The old K&WV truss bridge, a fixture for nearly a century, meets its end as it plunges into the river below. Image courtesy Mike Thomas. Blue Creek blossomed into full glory with the discovery of the great oil field in 1912. 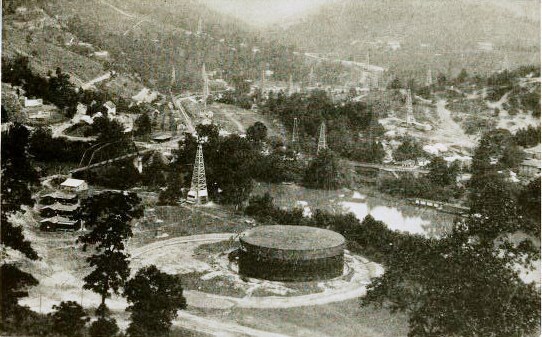 Oil wells were drilled in quantity extending west to the Pinch area and reaching Clendenin to the east. Well derricks rivaled trees as they were erected virtually everywhere the eye could gaze. The roadbed on the newly constructed K&WV had barely settled when the great boom arrived. As a result, both the Kanawha and West Virginia Railroad and the Coal and Coke Railway had precisely the right instrument in the right place and time to capitalize on this economic bonanza. Within this boom ensued a rivalry between the two roads, often bitter. The Coal and Coke had been completed first; when the K&WV was under construction, it had to cross the C&C at Blue Creek facilitating a crossing of the two on a diamond. Lease terms for this junction were construed whereby the K&WV paid the Coal and Coke but it failed to fully comply. As a result, conflict arose with the C&C ultimately removing the diamond climaxing a hostile situation between the roads. Eventually, an agreement was reached and the crossing was reinstalled and remained permanent. In the years post-dating the oil boom, Blue Creek subsided in commercial importance to both railroads but remained prominent as a junction. B&O first took control of the Coal and Coke Railway before ultimately acquiring outright ownership of the line. Its passenger trains continued to stop as well as freight trains passing between Charleston and Gassaway. 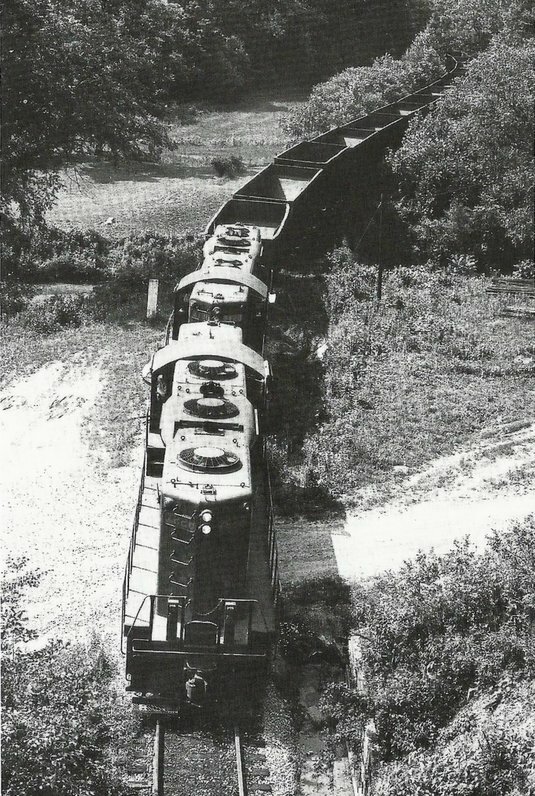 The K&WV continued running passenger trains between Charleston and the Blue Creek drainage and effectively relegated to a coal hauling road. In the years after the end of the oil boom to the World War II era, the tempo of traffic through Blue Creek remained consistent barring any economic ebbs and flows, particularly in regards to coal. Note: Additional Blue Creek images can be found on B&O Charleston Division Part I-Charleston To Blue Creek. Click here for the link. Passenger traffic lasted longer on the K&WV, now New York Central, than on the B&O. The last B&O passenger train called at Blue Creek in 1951 whereas the NYC continued running trains until 1962. As previously discussed, the trains remained on the NYC until this late date due to poor roads in the Blue Creek watershed whereby the trains--and eventually, a single RDC---served as a school bus on rails. 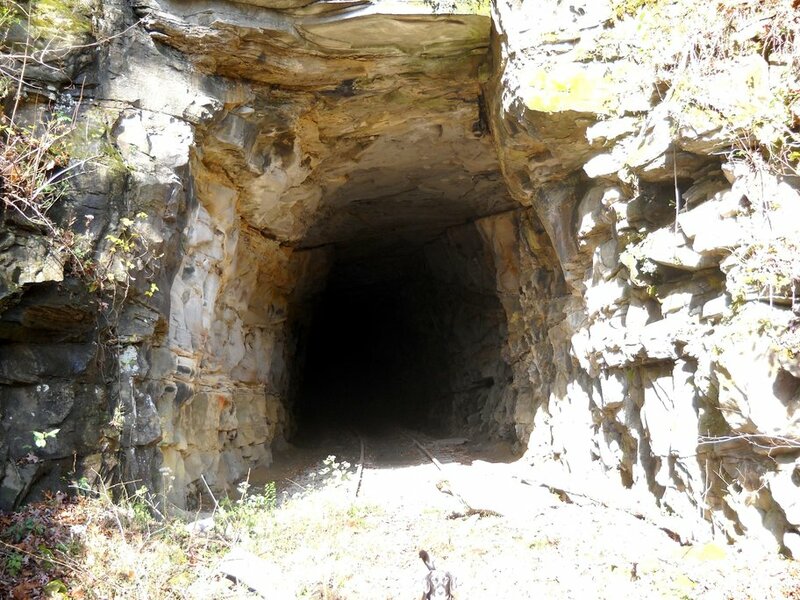 The east portal of Tunnel #1 provides a good glimpse of the cut through solid rock and the tight clearance. Image courtesy Carlos Morris. 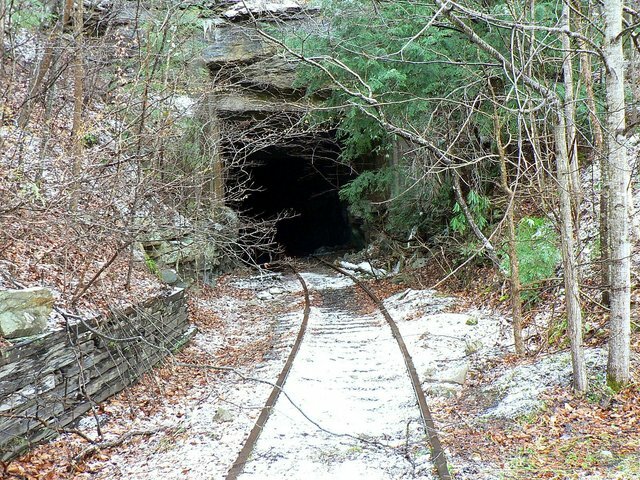 The second crossing of Blue Creek beyond the east portal of Tunnel #1. A tranquil scene that begs for the emergence of a train and a fishing pole. Image courtesy Carlos Morris. From the early 1960s to the late 1970s, the frequency of trains decreased at Blue Creek. B&O ran a through train that returned the following day and coal traffic on the NYC fluctuated on demand with variances in the number of trains. This remained in effect into the Penn Central and Chessie System eras until the B&O was abandoned between Reamer and Hartland effectively ending Charleston service. 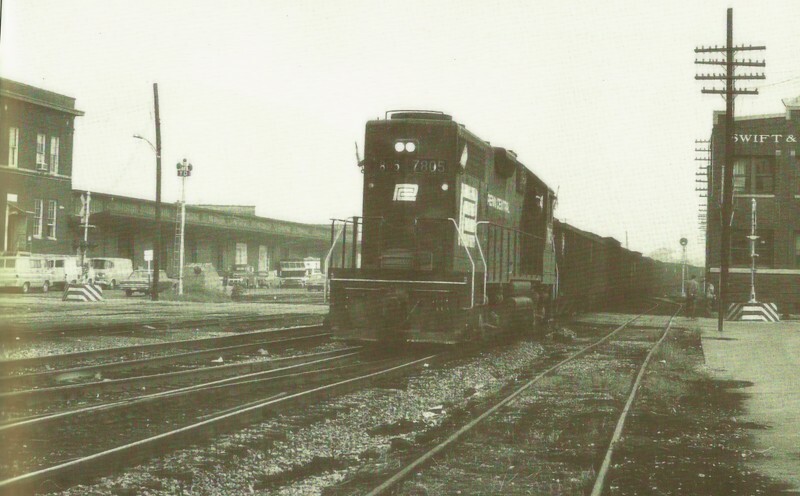 The only remaining trains to pass through Blue Creek on B&O rails were the switching turns from South Charleston that served the Elk Refinery. Coal trains had turned from NYC to B&O rails since 1967 when the old K&WV from Charleston was abandoned but consequently had no impact on the number of movements. 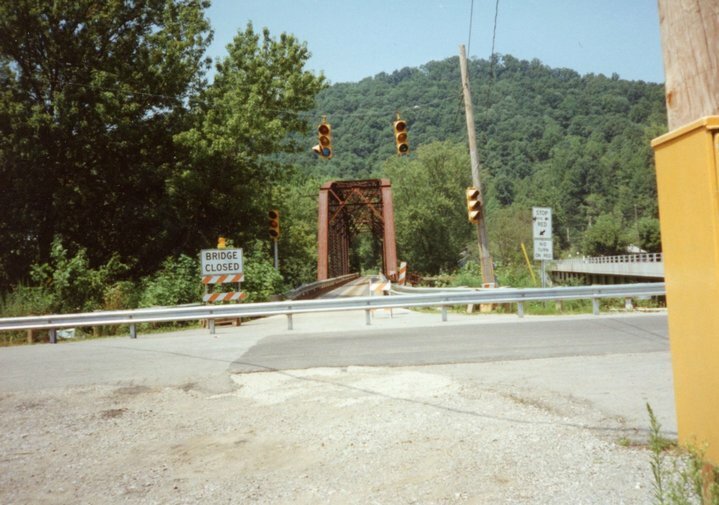 The K&WV Elk River bridge was still in service to serve a short stub of track along which were located Clendenin Lumber and Halliburton Industries. Scenes such as this magnify the passage of time since coal trains last ran through here. Compared to most man made creations, an abandoned railroad track tends to blend into the surrounding scenery. 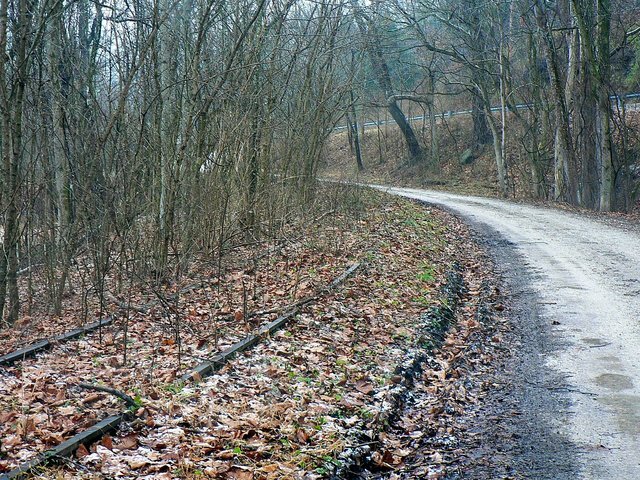 Former K&WV rails near Three Mile along Blue Creek. Image courtesy of Harry Lynn. 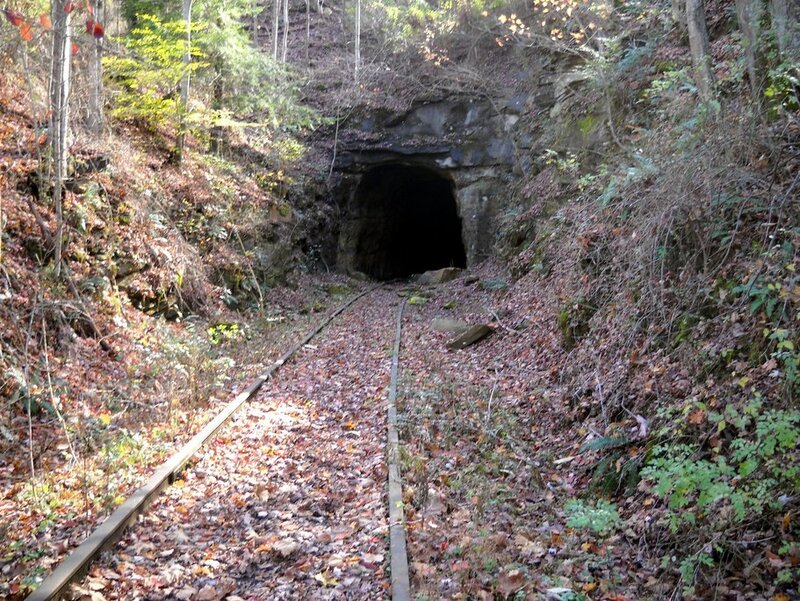 At Three Mile began the coal mining sector of the K&WV RR. 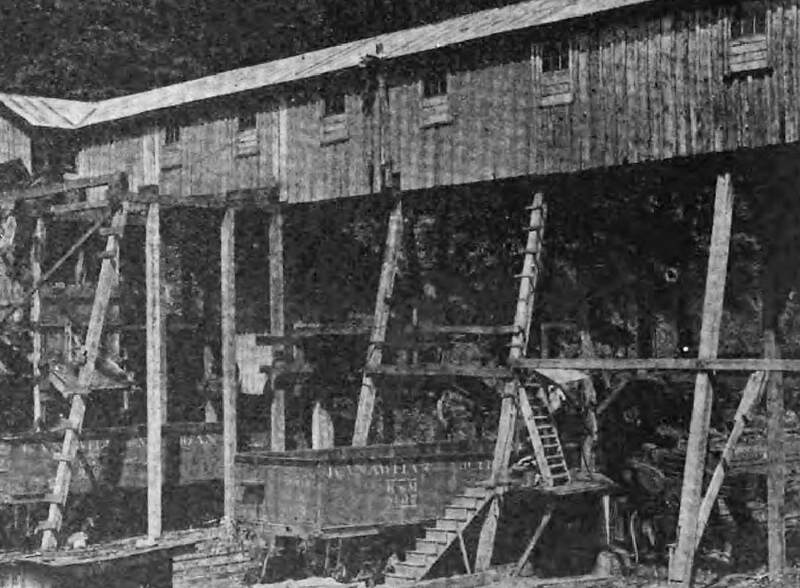 An operation was opened here by the J. W. Miller Coal Company at Shrader. Mining also developed in the vicinity of Quick during the early years. 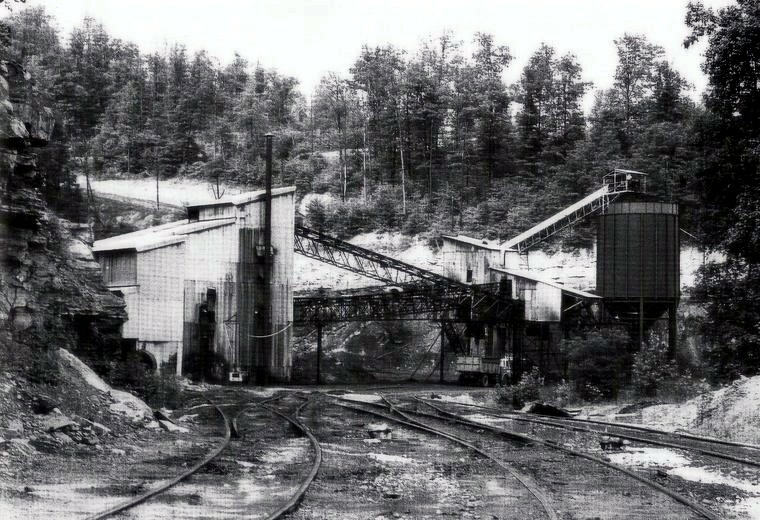 Listed active mines from the 1920s include the Slack's Branch Coal Company and two mines of the Standard Kanawha Coal Company. In later years, Union Carbide also owned active mining in this vicinity as well. The mountainous terrain of the Blue Creek watershed as traversed by the K&WV. Narrow valleys and tight curvatures defined the line as it passed through small mining communities laden with black diamonds. Other small coal hauling roads such as the Campbells Creek Railroad were in proximity separated only by the creek divides of the mountains. The railroad from Blue Creek to Hitop was a crooked route paralleling and continuously crossing the creek for the right of way to best take advantage of the terrain. Built on tight curvatures and generally lighter weight rail, speeds and tonnage were restricted. The New York Central was plagued with derailments due mainly to light maintenance and a reluctance to upgrade the line with heavier rail. With the onset of Penn Central and its financial woes, this trend continued as the route was acknowledged as a maintenance nightmare. Adding to ongoing maintenance concerns with track, there were also the numerous bridges and trestles that compounded the problem. This does not even take into account repairs occurring from high water and washouts. Motive power used throughout the years was restricted to the limitations of the line. Since its construction was on lighter rail---such as 90 pound--and due to curvatures eclipsing 10 to 12 degrees, only light to medium size steam power could operate within these limitations. Upon the onset of the diesel era, four axle units were the norm. Typically GP9s from New York Central through Penn Central, the practice continued until the final years of Conrail with GP35 and GP40 class locomotives. Naturally, the tonnage of trains was adjusted within the specifications of the horsepower and tractive efforts. The west portal of Tunnel #2 to the east of Quick. This bore appears to have been relined at some point in the distant past. Dan Robie 2010. 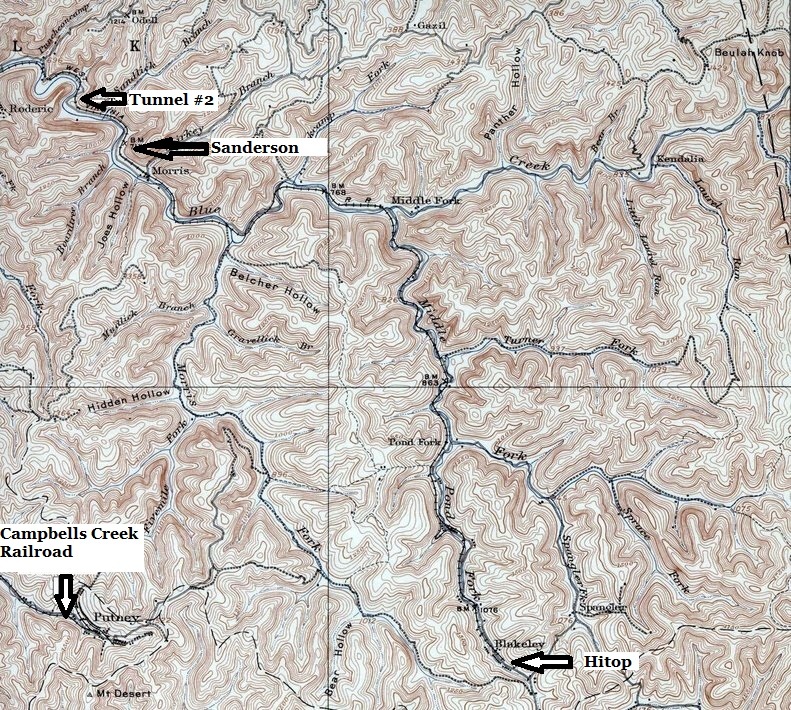 The abandonment of the K&WV between Charleston and Blue Creek in 1967 had no significant impact on the Blue Creek to Hitop sector. In fact, it could be stated that in reality, the movement of trains actually improved. Trackage rights over a better maintained B&O facilitated train movement between the two points. If one negative aspect could be introduced, it would be the frequent congestion and switching at the Capitol Street yard and terminal that trains faced coming to and from the B&O. 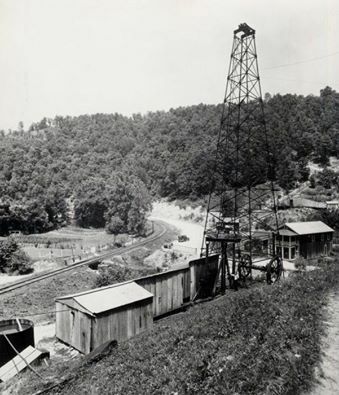 Once one left the concentration of oil derricks on the trek up the Blue Creek watershed, the railroad landscape transformed from that of the oil field to the coal mine. 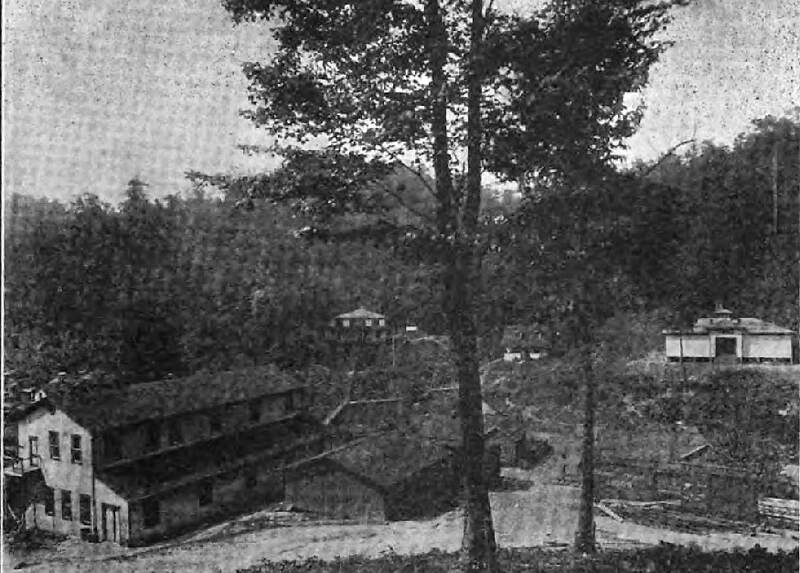 Mines of varying sizes in terms of tonnage capacity populated the small communities along the creek. Numerous mines of differing ownership were prevalent in the K&WV era lasting into the early New York Central period. By the time of the Penn Central and ending with Conrail, the remaining coal mining activity was firmly under the umbrella of the Union Carbide Corporation. During the early years, the destination of hoppers loaded with coal was more widespread. By the time of Union Carbide ownership, the coal trains were dedicated short runs to Kanawha valley locations such as Alloy and Institute. 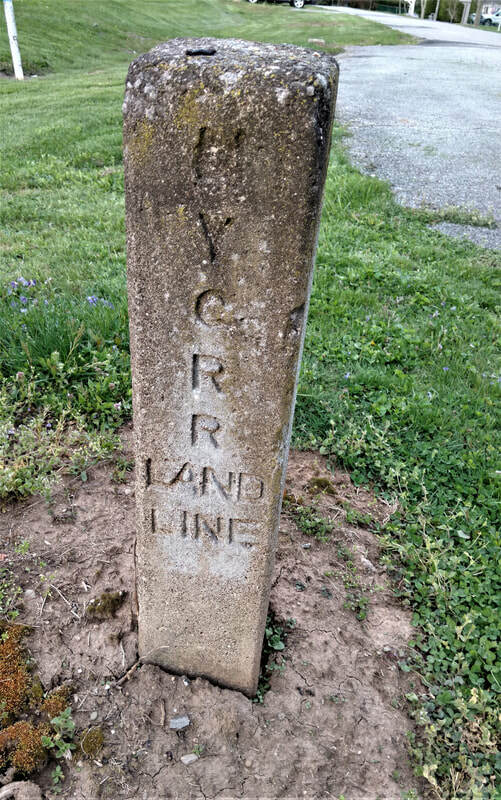 In spite of operational hindrances, there is no question that this stretch of the route was the heart of the Kanawha and West Virginia Railroad. It was established as such from a revenue perspective during the early years continuing into New York Central ownership. Today, looking in the rear view mirror, it remains so in the cozy confines of nostalgia as memories flourish of a simpler time. Many regional residents recall with fondness the “school bus” trains that were first steam powered and at their conclusion, rail diesel cars (RDC) that culminated their runs in 1962. These were twice daily runs between Charleston and Hitop with Elkview High School the primary point of the school passenger base. During the early 1900s, the Blue Creek Coal and Land Company owned large acreage in this area that was developed for mining. The company operated two mines at Blakely and another nearby at Wills Hollow. Another operator with interests near Blakely was the Strange-Elliott Coal Company with a mine at Hitop. With the passing of years, coal mining operations began to dwindle, train frequencies decreased, and by the end of the New York Central era, Union Carbide mining activity was primarily concentrated at Hitop and Sanderson. Early into the Penn Central, activity at Hitop had ceased by 1971 leaving only the Sanderson region as the major load out. This remained in effect during the metamorphosis into Conrail by the late 1970s and continued for another decade. By 1990, all shipments by rail had ceased and the railroad has rusted ever since. A flurry of speculation burst onto the scene during 2010 when plans were announced about renewed mining and shipment by rail. The proposed name of this line, the Charleston, Blue Creek, and Sanderson, was to incorporate the former B&O from Charleston to Blue Creek and henceforth from that point to Sanderson over the former K&WV. For various reasons, however, these plans have been forestalled with no news concerning a reactivation for a few years as of the time of this writing. Realistically, the majority of track is still intact throughout the route but it is in dilapidated condition and would require extensive rebuilding in addition to almost thirty bridges. Five years hence, the political and environmental climate is unfavorable not to mention the shifting from coal to gas as an energy source. All circumstances considered, the future reconstruction of this railroad is dubious at best.